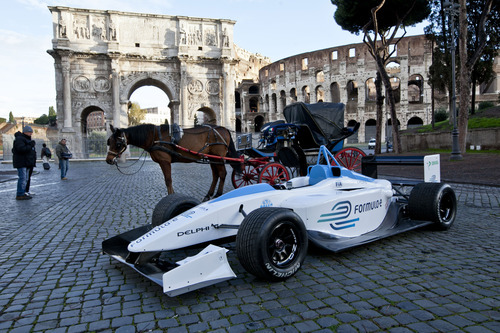 The Formula E electric race car series set its 2014 itinerary on an around-the-world tour of electric racing action. The preliminary calendar presented to the FIA include two races in Europe, two in North America, two in South America and two in Asia. South America: Buenos Aires and Rio de Janeiro. The series organizers say they still plan to hold 10 races during 2014, and that two slots are being kept open in the calendar "to include 2 additional cities among those that have expressed interest." At this time Formula E Holdings is working with prospective host cities "to discuss all the specific elements involved in hosting a street race." The goal is to have signed agreements by July 1, 2013. The final calendar will be presented to FIA for its approval at the September 2013 World Motor Sport Council. Two teams are currently signed up - China Racing and Drayson Racing. The cars are being designed by McLaren, Spark Racing Technologies and Dallara. 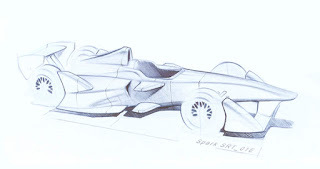 The latter released sketches last week of the race car design. The Mayor of Miami, Tomas Regalado commented: "We are enthusiastic about the future organization and promotion of Formula E, the worldwide championship for electric single-seater cars, sponsored by de Fédération Internationale de l´Automobile." Alejandro Agag, CEO of Formula E Holdings, said: "We are thankful to all the cities that have expressed their willingness to host our races. The fact that cities from all over the world are interested in the FIA Formula E Championship is extremely heartening and shows a global commitment to clean mobility and sustainability. The provisional calendar we publish today is composed of cities in America, Europe and Asia. We look forward to also racing in Africa and Australasia from 2015 onwards."